Successfully Added Teclast T8 Tablet PC - Android 7.0, Hexa Core CPU, 4GB RAM, 8.4-Inch Screen, Fingerprint Scanner, 5400mAh Battery, 13 MP Camera to your Shopping Cart. The 13-megapixel front camera and 8-megapixel rear camera allow you to take crisp and bright pictures. This Tablet PC is powered by an MT8176 processor & 4GB RAM that deliver a high performance and smooth user experience. 8.4 inches screen with 2560 x 1600 resolution display enables you to enjoy amazing graphics. The Tablet PC has 64 GB internal storage that can be expanded up to 256 GB. The Teclast T8 Tablet PC was designed keeping in mind the needs of gamers and heavy users. It is powered by Hexa Core processor and has 4 GB RAM. You can enjoy multi-tasking and play heavy games without any lag or dropped frames, the Mali IMG GX6250 graphics processor ensures you get smooth graphics. The sleek design of the T8 tablet PC makes it easy to hold as it is lightweight. 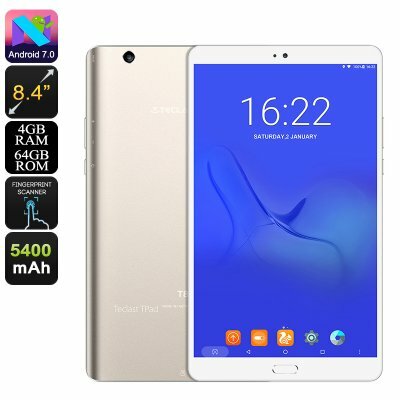 The T8 tablet runs on the Android 7.0 operating system that lets you have access to the latest Android features along with all the new apps and games from the Google Play store. This will help you have an exceptional user experience. This Tablet PC has a display size of 8.4 inches with 2560 x 1600 resolutions. You can enjoy wonderful image quality that will bring all your media to life in stunning detail. This Tablet PC is perfect for gamers as it provides improved graphics. You can take your gaming skills to a whole new level. Furthermore, you can enjoy your favorite TV shows and movies with better resolution for an immersive viewing experience. Packing a 5400mAh battery capacity this Tablet PC will last for 3.5 hours of continuous heavy usage. The battery standby time is 40 hours while the charging time is just 3 hours. This gives you ample of time to enjoy your favorite media and games. The Teclast T8 Tablet PC has a rear camera 8-megapixel with the 13-megapixel front camera. So you won’t have to carry a camera with you to take crisp pictures. The T8 Tablet PC lets you take sharp and bright pictures of the amazing moments. You can now have a video chat with your friends and loved ones thanks to its great front camera. This PC has 64 GB internal memory that can be extended to 256 GB. So you are given plenty of space to keep your files, documents, pictures, videos, songs, and other things safe. it gives you the opportunity to your files with you anywhere without worrying about low storage. The Teclast T8 tablet PC is perfect for keeping you entertained throughout the day. With the great camera, you can keep cherished moments safe for a lifetime. The Teclast T8 Android tablet comes with a 12 months warranty. Brought to you by the leader in electronic devices as well as wholesale tablet computers,.